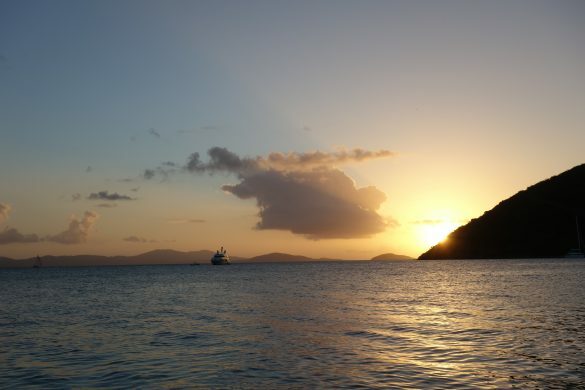 Home British Virgin Islands	Is This The Most Beautiful Island In The Caribbean? I think we’ve found the most beautiful beaches in the Caribbean! Our friend Shiner arrived into the BVI with the intention that we’d spend a week or so cruising the islands before heading north to Grand Turk. His mother originally hails from there which was the main reason Shiner wanted to do this particular passage with us in the first place. 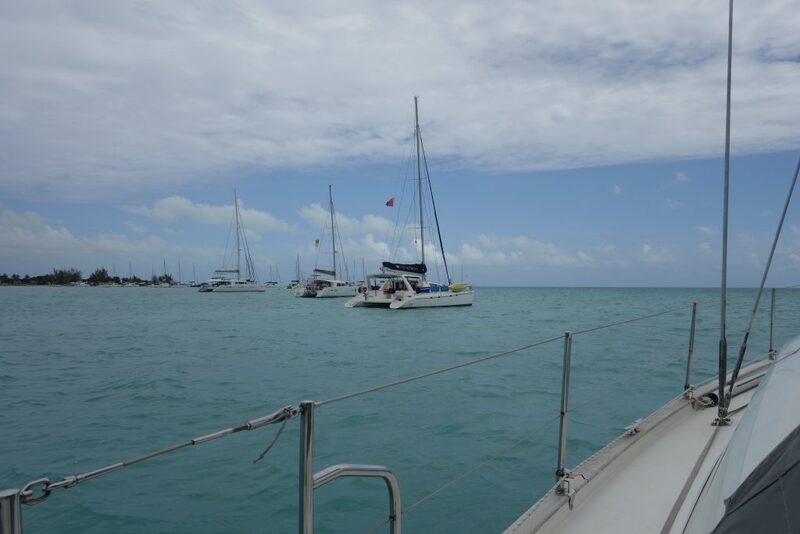 Because we can only stay in Turks and Caicos for 6 days before needing to buy a rather expensive cruising license, we couldn’t leave the BVI’s straight away- even though there was a weather window. 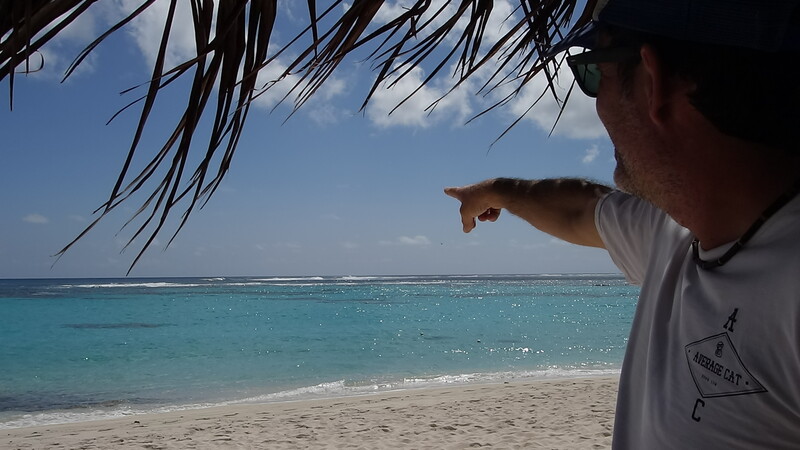 Looking at the long term forecast, it looked as though there would be some big swells coming from the north, but once they passed through we’d have just- just– enough time to get to Grand Turk, spend a couple of days exploring before putting Shiner on the plane. However, the weather Gods had other ideas. As the planned departure date got closer and closer, the forecast continued to deteriorate. A low pressure system was pushing its way further south which meant westerly winds- very unusual for these parts- were now featuring in the forecast for a couple of days. This wasn’t good. It would mean a beat into the wind for at least two days, which… no. Despite Shiner’s disappointment, he’s an experienced enough sailor to understand that sometimes the weather has other plans, and you just have to abide by them. 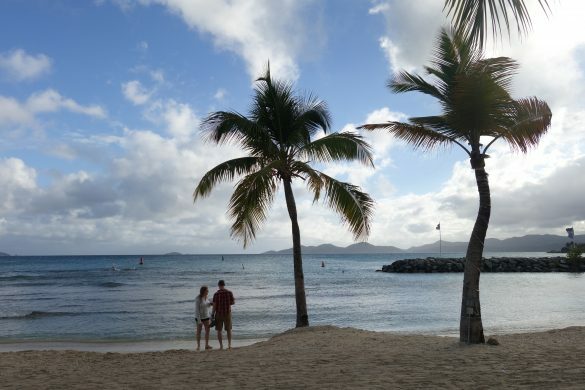 He was loving pottering around the BVI’s and he made the very sensible decision to change his flights to leave from Tortola instead, and we’d go up to Anegada for a few days and a consolation prize. And what a consolation prize that turned out to be! Best sail of the season! 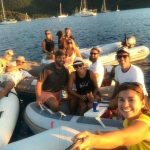 We had spent a couple of nights in Norman Island, home to the infamous Willy T bar and had a great time with friends on Freebird and Salah. 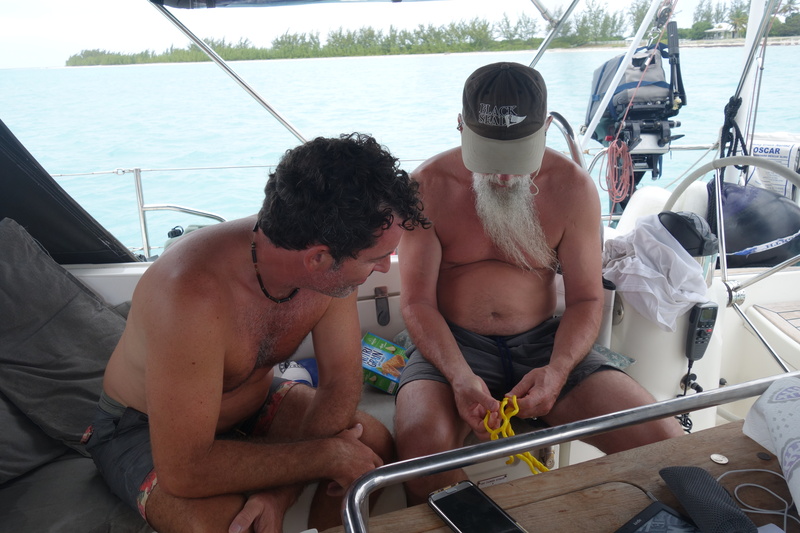 That gave us about a 20 mile passage north to Anegada and the sailing conditions were utterly perfect. 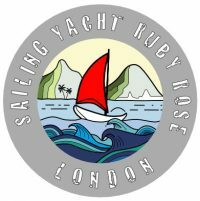 15 knots on the quarter, bright sunshine, calm seas- this is what sailing is about! Shiner got a chance to fiddle with the sails to his hearts content (he is such a fantastic sailor and so happy to share his impressive wealth of knowledge- we learned a lot over the two weeks he was here, and we thought we were pretty good at sailing our boat!). Anegada is a very flat island- I’ve heard it be compared to the Bahamas in that sense. You can’t see it until you’re only 5 or so miles away, and even then all you can spot is a line of trees. This is very different to the rest of the BVI’s which are mountainous. 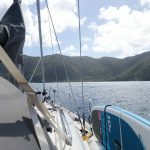 We motored up the channel, a little dismayed at all the boats we’d be sharing the island with, and tucked ourselves into a very shallow spot behind the catamarans. I wonder what they thought when they saw us- a monohull- motor behind them in such shallow water! We couldn’t help but feel very smug about our lifting keel. 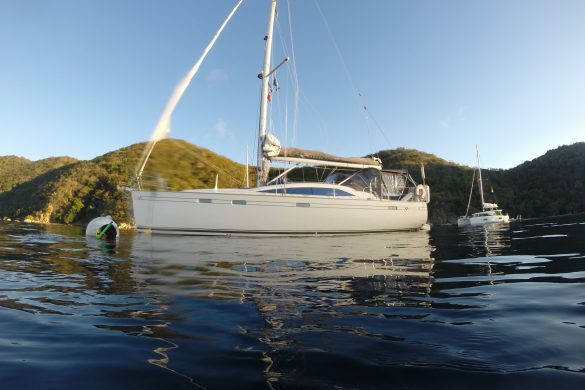 We anchored in just 1.2 metres of water (under the hull) and went ashore. Even the catamarans are in deeper water than us! We loved this car, really. Everyone said we should go to the north shore beaches and, since there wasn’t much else to do nearby (I mean that in a good way- it was wonderfully low-key) we decided to fork out the $60 for a hire car. It was a discounted price and we saw why. The car was metallic purple with one white panel. We piled in, Nick turned the engine on, and put it into gear. Nothing happened. Tried again. The car didn’t move. A passer by stopped to help, but could shed no light on the situation. Just as Nick was about to go back into the office, he tried putting it into D2 instead of D3. There we go! We were off! We rattled our way out of the small town and onto the main road. The list of problems with the car continued to become evident. The electric windows didn’t work (or rather, they worked sometimes but not others. It was pure luck as to whether the window would actually respond to a push of the button, or if it would just stay stubbornly where it was), there was no muffler, the suspension was wrecked, the doors wouldn’t open except from the inside…. There was a purple plastic diamond for a gear shift, a big Hello Kitty motif on the glove box and the interior and exterior was all a bright purple. We loved it. We found the north shore beaches with no trouble- the roads were very well signed and the island is only small. Loblolly bay and Loblolly beach are next to each other, although I can’t remember which was which- and I was pretty confused at the time as well. However, they were equally stunning. White powder sand, an offshore reef breaking up all the surf, and a lagoon of crystal clear turquoise water inside the reef. Apart from one other group, we had the place to ourselves. 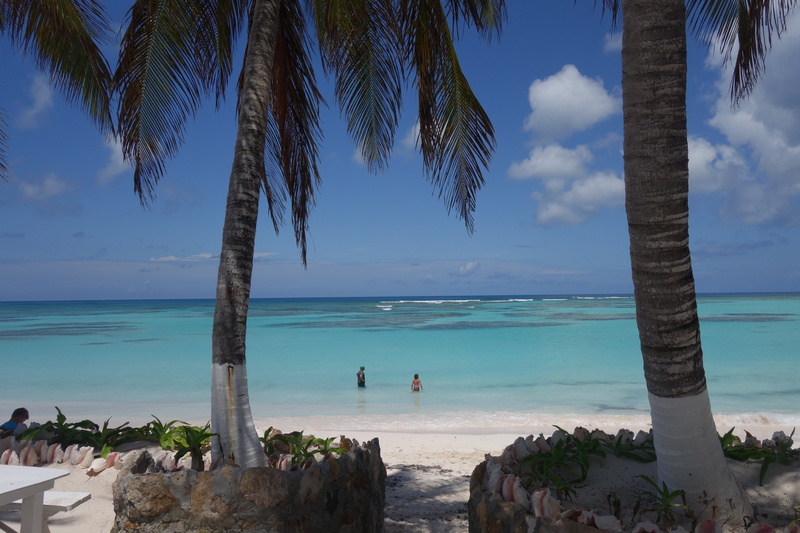 We went swimming (the coral was unfortunately in pretty bad shape, like many other places in the Caribbean, and the current was strong- but the water was beautiful), took some photos, did a YouTube Live stream from the beach, and then piled back in the car to head to Cow Wreck beach for lunch. Cow wreck beach, taken from the restaurant. Nice view, right! Cow Wreck was just as stunning, if not more so than Loblolly. There was a cute little beach bar and restaurant which we’d been told was good, and so we dutifully ordered some food (which took an hour to come out despite only a couple of tables and our order being quite simple… but never mind) and took in the incredible view. Shiner left us a few days later from Soper’s Hole in Tortola. We put him on the 6am ferry to St Thomas and said our goodbyes. Nick and I agreed that he really had been the perfect guest and we made tentative plans (all sailing related plans are tentative!) for him to come back out for one of our longer passages next year. 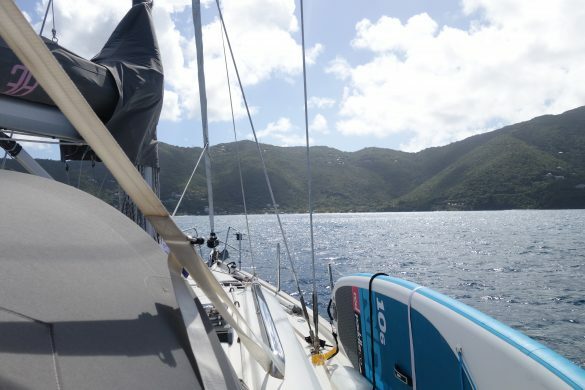 Once he had left, Nick and I headed back to St John to clear into the USA again and ended up having probably the best weekend we’ve ever had sailing- but I’ll leave that for next week. Can Life On A Boat Get Any Better Than This?